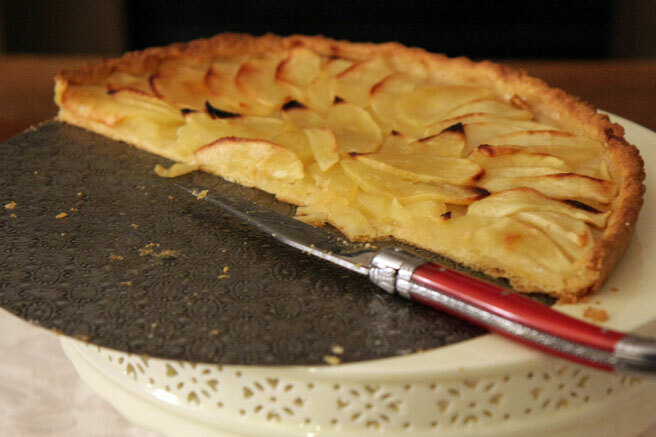 An apple tarte came from my kitchen the other night not only without using a recipe, but also without any measuring whatsoever. This includes the crust. Have you ever heard of such a thing? Too lazy to even break out the kitchen notebook, I threw some flour in the bowl, cut an approximate lump of butter, worked it, added an egg yolk, a dollop of creme fraiche, and there it was. Turning the chilled rolled dough into my lovely new old pie tin which I rescued from a wet crumbling cardboard box at the fleamarket, which I cleaned and polished and adore and maintain no matter how little it cost me, I then just put in the fruit and sugar, and voila - an apple pie was in the oven, filling the house with something bigger than the sum of its parts. I wonder if a resonating kind of magic had anything to do with it. I have this pair of earrings, a necklace, a pie tin, these things I know were cherished and adored once by women with luck who lived full lives through hard times. With costume jewelry that they meticulously maintained, a multitude kitchen table tartes and pies that they prepared for their families, they worked through to achieve something beautiful. You pick up these objects and you know. Meaning. Then maybe they died quite old, they told their stories. Their estates liquidated, their kitchen implements and their jewelry boxes emptied into cardboard boxes, and certain objects come into my hands. When I clip on the pearly earrings, I feel protected, looked after. When I cook with the tin, it just turns out. Everything. I don't even have to measure my ingredients. Good things happen. A haze of opportunity surrounds them. I willingly make use of this magic, open myself to it. Shamelessly. It makes me think that this might be some scene in a fantasy story, the magic pie tin in which the woman finds out that no matter what she haphazardly slaps together into the tin, it transforms into a lovely tart that enchants anyone sitting at her table. One by one, pearls like these are found and strung together, a lucky necklace spanning a lifetime. Sometimes they aren't easy to spot but once you've found them, you'll never lose them, you know. It is this string of pearls I want to hold on to when I'm looking back, to help me remember and be remembered by. I love cooking with noe recipes and it all just comes together to create something marvelous! Thats the best feeling. I love your blog so much. When I read it, cozy in a pool of warm sunshine as spring has finally hit Vermont, it's all I can do to not buy a ticket to France. Thanks for your wonderful insights, photos and inspiring creations. Oh I really enjoyed this post. This is the sort of cooking I do all the time. It does seem a bit magical, not knowing exactly what you're going to end up with. I bet your pie tin is very happy to be a useful friend in the kitchen again. lovely and inspired post. Thanks for sharing. This is a beautiful post! The words and meaning conveyed are universal. Truly lovely! I am enchanted by your blog...and this entry is truly special. Just plain TRUE. Having worn my church Christmas sale enameled 1-inch pansy pin with a 'pearl' in the center today, I know just what you mean. Whose jewelry box did this inhabit decades ago? Although jet-lagged from an overnight flight home to Massachusetts from Zurich, and back to work the same day, I felt especially bright and inspired today. You put into words the magic of such a find. Now, since I may have kept the attention of many brilliant bakers, I wonder if anyone has tried to recreate the apple-nut cake served in the Swiss Manor Dept. Store restaurant on Bahnhofstrasse in Zurich (maybe elsewhere, too)? This is a heavenly creation, topped with a mixture of pecans, cashews, pistachios and almonds. I am going to attempt my own version, but if anyone happens to have the actual recipe, I would be grateful. I agree. Just gorgeous. Just right. Just true. Still wending my way through your archives and savoring the ride.